This fourth republished article about writers I’ve been inspired by is a very personal one, because not only did I love the work of the great American children’s writer Lloyd Alexander, but I also knew him personally, at least by letter, as we corresponded over many years. This article was written after he died in 2007, and was originally published in Magpies magazine. The world of children’s literature has lost a great light. 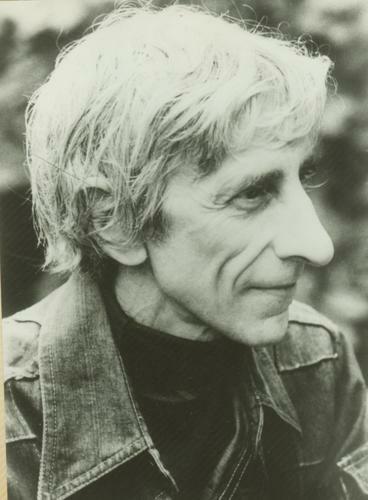 On May 17, 2007, the American writer of many classic children’s novels, Lloyd Alexander, died of cancer at his home in Philadelphia, only two weeks after the death of his beloved wife Janine, with whom he’d shared sixty years. Beloved of readers and critics alike, his work spanned more than forty years, and more than forty books, and as a fantasy writer, he is reckoned to be in the ranks of such as JRR Tolkien, CS Lewis, TH White, and JK Rowling. In fact, I’d go so far as to call him the greatest American writer of children’s fantasy of modern times. Many people would agree with me. He has a huge, devoted worldwide audience. His six-volume Chronicles of Prydain have been continuously in print since 1963, with the first two, The Book of Three and The Black Cauldron, made into the 1985 Disney movie, The Black Cauldron, which has always had a mixed reputation—many readers being disappointed by the fact that too many of the events of the books were shortened, and too many characters dropped. The books themselves however have had no such mixed reviews. Who can resist Taran, assistant pig-keeper’, and his oracular pig, Hen Wen? The feisty Princess Eilonwy? The bard Fflewdur Fflam? And the noisy, messy creature, Gurgi? It’s not only the characters, though, or the action of the books—which is considerable—or the exciting plots, or the scary villains and mythological richness of the background that readers take to their hearts: it’s a warmth, a humour, a wit, a love of language, a lightness of touch and a playfulness, which is all too often lacking in fantasy. Yet he also doesn’t shirk the darker side of life, and of people. There’s an extraordinary honesty, yet a compassion, in all his work, which is immensely attractive. 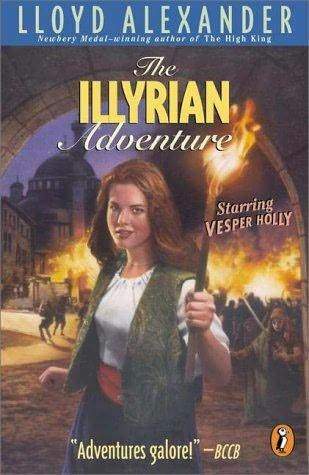 Readers love the Prydain books, and dearly: to the extent that I know of at least two people who so loved them as children that they were inspired to name their children after them. One friend named her first-born son Lloyd Alexander; another named her youngest son Taran, after the hero of the Chronicles. 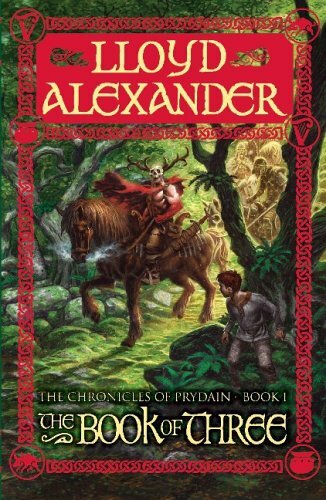 But it’s not just the Chronicles of Prydain, with their earthy yet mystical Celtic mythological background, that Alexander is famous for. He wrote a large number of wonderful, versatile fantasy adventure novels, set against all kinds of backgrounds and inspired by all kinds of fairytale and mythological sources. Long before it was fashionable, Lloyd Alexander delved into all sorts of multicultural influences. 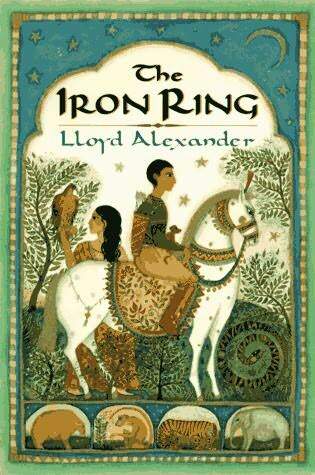 There’s The Iron Ring, for instance, inspired by Indian myth; The Remarkable Journey of Prince Jen, based on Chinese sources; The Marvellous Misadventures of Sebastian, with its Central European flavour; The First Two Lives of Lukas-Kasha, with its roots in the Arabian Nights; The Arkadians, with its source in Greek myth. And many, many more. There are certain recurring motifs in his books: cats, music, the quest for true courage and love. And fun. Pure, unadulterated fun. He is such a fun writer, in all sorts of ways: pure pleasure to read, beautiful to read, because everything is so well put together, so deft and exciting and funny and warm and moving and intelligent. And his considerable learning and experience are worn lightly. A man who had travelled very widely and was interested in all kinds of cultures and always curious and intrigued by the amazing richness of the human experience throughout the world, he was also very much a homebody, who dearly loved his city of Philadelphia, where he was born and bred, and where he lived with his family for most of his life, apart from a few years away in Europe. That deep knowledge of ‘Philly’ as well as of other places shows up very strongly in his marvellous comic adventure series, set around determined 19th century Philadelphia schoolgirl detective Vesper Holly, and told in the rather flustered, fussy tones of her guardian Professor Brinton Garrett, known as ‘Brinnie’: these include The Illyrian Adventure, The El Dorado Adventure, The Drackenberg Adventure, and more. He also wrote a historical adventure series, The Westmark Trilogy, set in a world that rather ressembles Revolutionary France. He wrote several books that weren’t strictly speaking fantasy, including the delightful semi-autobiographical The Boy and the Gawgon. And he also wrote for adults, for the first few years of his career, until he switched to children’s books in 1963. His first book, an autobiographical novel called And Let The Credit Go, was published in 1955. A fluent French speaker (his wife Janine, whom he met at university in Paris after World War Two, after a stint in the Army and in counterintelligence, was French) he is also the author of several translations of important French philosophical and poetic works, including Nausea, by Jean-Paul Sartre, Uninterrupted Poetry, by Paul Eluard, The Sea Rose by Paul Vialar. Yes, the world of children’s literature has lost a great light. Readers everywhere have lost a great writer, though there is that wonderful backlist to enjoy. 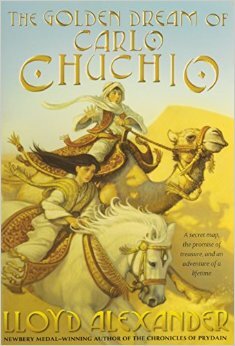 And his last book, The Golden Dream of Carlo Chuchio, will be published in August. But it’s more than that for me. I feel like I’ve lost a real friend, as well, because for the last ten years, I’ve been corresponding frequently with Lloyd, exchanging letters and cards(he didn’t like computers, and never used email)and swapping books with him. The bright row of Lloyd Alexander books on my bookshelf, all inscribed by him in his characteristically warm and friendly style, will be doubly precious to me now. It’s not always true that a great writer is a great person, but when the two coincide, it’s pure magic. That was certainly the case with Lloyd. From the very first letter he sent me, in January 1997, in response to the enthusiastic missive I’d sent via Cricket magazine(with whom he was associated), after my children and I had finished reading The Chronicles of Prydain, you could tell that here was a generous, warm, intelligent and modest person, a real gentleman in the very best sense of the term. Finding we had a good deal in common—writing, France, music, Celtic myth, travel, and much more—we continued to correspond fairly often over the years, and sent each other signed copies of our recently-published books. 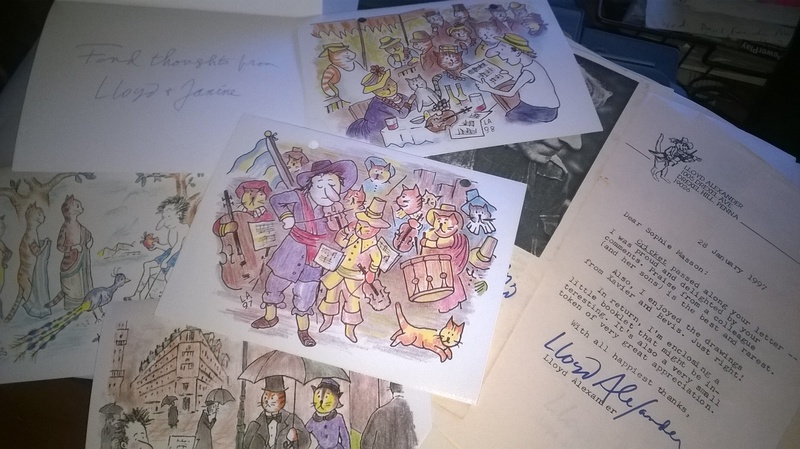 Lloyd always replied to letters promptly, typing or handwriting on his own distinctive pale yellow letter-paper, with the drawing of a cat playing the violin(thereby combining two of his great loves, as well as indulging his sense of humour). The elegant envelopes postmarked ‘Drexel Hill, Pennsylvania’ were always welcome arrivals in our mailbox! Lloyd was always ready with a kind word and a friendly remark, and his generous and perceptive understanding of my own books heartened me enormously, and meant a huge amount to me, as did the warm and intelligent quotes he provided for my publishers when my books started to be published in the USA. Over the years, we shared snippets of information, and exchanged news of family and of friends(he was tickled pink by the knowledge that two of our friends had been inspired to name their kids after him and his characters!) And we exchanged Christmas cards—his featured his own delightful coloured drawings of a fantasy cat world, from the poshest drawing-rooms to the rumbustious tavern, with each year a new scene.. It may surprise non-writers(or perhaps not! ), but not all writers are as supportive or as friendly and generous towards other writers as Lloyd was. In a competitive industry where egos can be as big as houses, there is all too often an urge to ‘do down’ or at least ignore other writers. Even when it’s not as bad as that, there can be a sense that really, what do you have in common except that you both write books? But when you do connect on a real level—the personal as well as the artistic—it is a very special friendship, even if that is conducted long-distance, as ours was, for we never met in person. And so I grieve for a good friend and a good writer, a good man and one who will be sorely missed, but whose books will live for ever. The years have passed, but we still miss you very much, Lloyd. Yes I loved Lloyd Alexander too. Still when I’m eating toast I talk about munchings and crunchings like Gurgi. Yes, that is so gorgeous isn’t it!